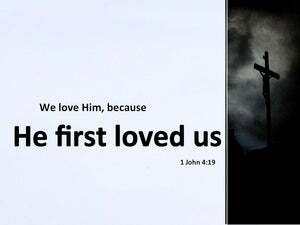 We love God because He first loved us and we demonstrate our love towards Him by obeying His command to love one another as He loved us, and this can only be achieved as we abide in Him and He in us - as we rest from our strivings and submit to the leading of His Holy Spirit within. Christendom is saturated with heretical and apostate teachings. 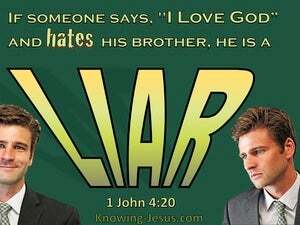 The heretic believes but distorts God's Word and strays from the truth of scripture while the unbelieving apostate puts-on a garment of pretense with a subtle but deliberate intent to lead Christians astray. Both exemplify a ploy of the enemy to prevent genuine believers from entering into spiritual maturity and the fullness of Christ. We have moved from the kingdom of darkness into the kingdom of light. 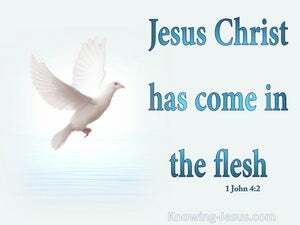 Our filthy covering of sin has been replaced with a robe of righteousness. 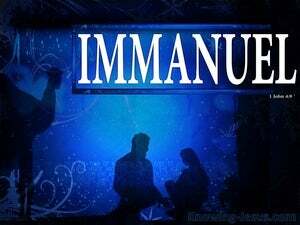 We have been transferred from a position in-Adam, and have been positioned in-Christ - and we have left the family of Satan to become an eternally adopted children of God and a joint heir with Christ. 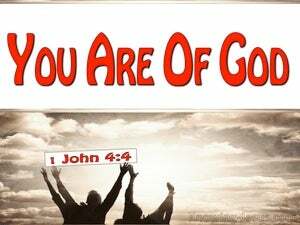 As children of God we have the permanently indwelling Holy Spirit of God, and it is in Him that we have complete victory over the world - with abiding and eternal results. 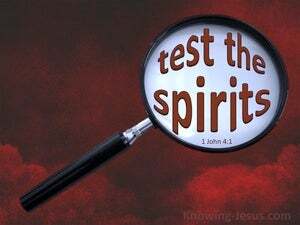 Nevertheless we are to be on our guard against the many false and deceptive spirits that are in the world today and are called upon to test each one, however benevolent or enticing they may appear, for not all are of God. Love is the source and the summation of righteousness and love is the new commandment that Christ gave His disciples as He prepared to leave them to be His witnesses upon the earth – love as I have loved you. Love flows from the heart of God to us and love is to flow though us to others as we are filled and replenished with His love in our hearts. 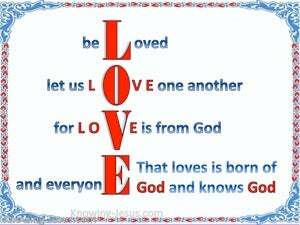 Love is the nature of God and from Him burst forth the fruit of His Spirit, which is rooted and grounded in love. 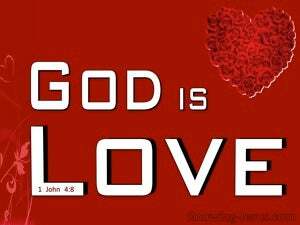 What a beautiful truth it is.. to know that God is love, and that the love that we are called to manifest in our lives, has its source in the divine love of God. How amazing to realise the outpouring of His unique love.. flows through us, to others, because we have become his children. The heart of God is the Spirit of love and He has demonstrated His love towards man in a multitude of ways, but the incarnation of His dearly beloved Son, the Lord Jesus Christ is the brightest and best signification of the love of God towards mankind. 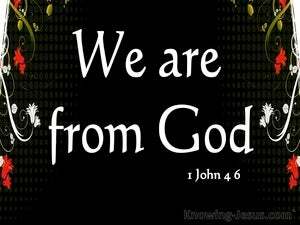 Having reminded us that God is Spirit and God is Light, the apostle John also now reminds us that God is Love - and each eternal quality of God by necessity.. must be indivisibly and eternally fused together with every other one of His holy, attributes. The essence of Who God is requires that each of His attributes are inseparably interlinked together. 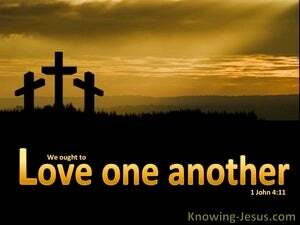 One single quality must never be divorced from His other holy attributes. 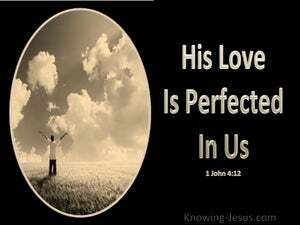 The eternal God loves us in three tenses: past, present and future - for He is the same yesterday today and forever. 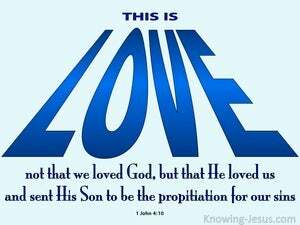 It is a divine love that cannot be compared with the inadequate love of fallen man, but is a love so penetrating, that He sent the unique, and only begotten Son of His love to be the propitiation for our sins. 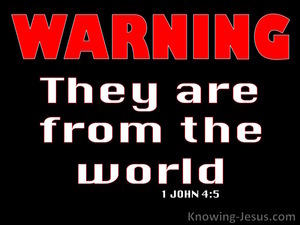 God is Spirit, and John tells us on a number of different occasions that no one has seen God at any time.. but for a brief season at Christ's first coming, the invisible God was made manifested to the world, through His only begotten Son, Who is in the bosom of the Father - He has revealed Him. 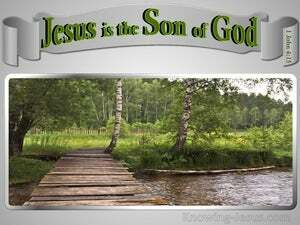 Christ had come to set up His kingdom, as foretold by the prophets but He was mocked and crucified. 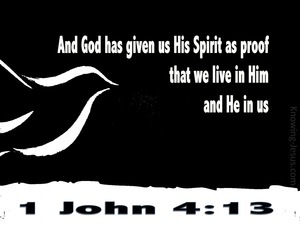 The privilege and blessing of being indwelt by the Holy Spirit of God is beyond our comprehension, and yet God has given US, the permanently, indwelling Spirit as PROOF that we live in Him and He in us.. and He has recorded this incredible gift of grace.. to us who believe on the Lord Jesus Christ, in His WORD. 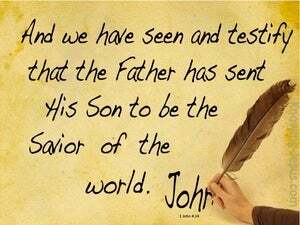 Perhaps this is the verse of all verses that encapsulates the very essence of God and what He has done for us; what He is doing and what He will continue to do in and through all who believe in the name of the only begotten Son of God and place their trust in Him. Fear, guilt and shame cannot coexist alongside faith, hope and love. 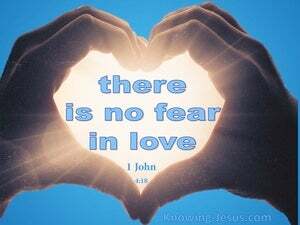 A confident loving-trust in God cannot cohabit alongside destructive fear, for the immeasurable strength from the power-house of God's perfect love overwhelms any negative influence of fear, rendering it powerless in the life of a believer. 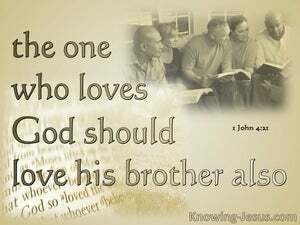 John has often been called ‘the apostle of love’, and many of his writings express the depth of God’s love for man. In his gospel, we discover the amazing things God has done to demonstrate His immense love towards us – in that while we were yet sinners, Christ died for us. Love is a theme that threads its way through all the writing of John, but it is in the later chapters of his first epistle that he brings the important theme of divine ‘love’ to the very forefront of our attention. 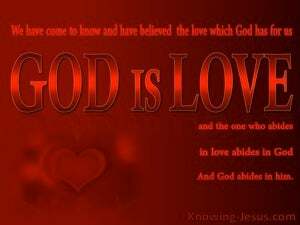 ‘God IS love’ John reminds us, and He manifested that love towards us in the Person and work of the Lord Jesus Christ.